user-generated Headlines and reports on this page = 5 news items. Page - 3. ALL new mums living in Cheshire and Merseyside are to receive a free Finnish style Baby Box from 25 September following a successful pilot in Halton. The initiative, led by the NHS Cheshire and Merseyside Improving Me programme, will include all new mums in the region getting a Baby Box as part of their antenatal maternity care. Families receiving a Baby Box also become members of the Baby Box University; an online education syllabus providing health advice and support on a wide range of topics, such as breastfeeding, smoking cessation, prenatal mental health and nutrition in pregnancy. This is supported with antenatal appointments with their midwives and additional sessions through the Baby Box community, which aim to reduce social isolation and provide additional guidance on use of the Baby Box and its resources. At the 1st meeting with a midwife, women will be given their card to access the Baby Box University. At around 28 weeks of pregnancy, all women will be invited to collect their Baby Box. Catherine McClennan, Programme Director for the NHS Improving Me programme, said:- "I'm delighted that we are able to expand our fantastic Baby Box initiative to all new families in Cheshire and Merseyside. 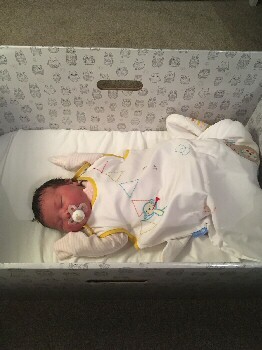 Baby Boxes are a powerful and internationally recognised engagement tool that will help us to reduce health inequalities, increase choice in pregnancy and deliver more person centred care as part of a maternity package of education." Simon Banks, Senior Responsible Officer for the NHS Improving Me programme, said:- "We have worked closely with local maternity experts to ensure we are providing an offer that supports improved maternity experiences for everyone. The feedback we have received from our pilot in Halton from families and health professionals has been fantastic and we are proud to be rolling the offer out across the region." Fiona Bryant, Interim Head of Midwifery at Liverpool Women's Hospital, said:- "We are pleased to be part of the Baby Box programme and looking forward to providing them to all new parents. This is a great way of providing useful information and resources as they prepare to welcome their little one into the world." First used in Finland in the 1930's, Baby Boxes are used across the globe as an established and recognised maternity engagement tool to support women and families throughout their antenatal and postnatal journey. In addition to providing a safe space for a new born baby to rest should they need one, Baby Boxes come stocked with ethically sourced 'starter' resources; such as nappies, breast pads and items of clothing; aiming to make life that little bit easier for new families. 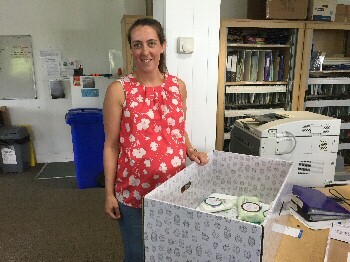 Jennifer Clary, CEO of Baby Box Co., said:- "Working in partnership with the NHS Improving Me programme team has been incredibly rewarding and I am delighted to see this innovative Baby Box programme expand beyond Halton to include all expecting and new parents in Cheshire and Merseyside." The Improving Me programme is a partnership of 27 NHS organisations across Cheshire and Merseyside aiming to improve the experiences of women and children. The Partnership is one of the NHS England's 'vanguard' sites (designed to create new models of care in the NHS) and one of seven maternity pioneers in the country. Further information about the Cheshire and Merseyside Baby Box initiative, including local distribution centres for all maternity providers, can be found online or via sending Baby Box Co an email. ► Crosby Police Station, from 1pm to 3pm, on Saturday, 30 September 2017. ► Maghull Police Station, from 1pm to 3pm, on Sunday, 1 October 2017. The only condition of receiving a kit is that any bikes being marked are required to be registered to a Sefton address. Local Community Sergeant Kate Young said:- "Theft and anti social behaviour involving bikes will not be tolerated, and this is another great crime prevention tool for owners. DNA marking has previously helped Police to reduce business robbery and burglary offences and can also be beneficial in targeting the theft and anti-social and criminal use of bikes and scooters. We are looking forward to welcoming members of the community this weekend and giving out the kits and any crime prevention advice that they need." Councillor Trish Hardy, Sefton Safer Community Partnership Chair, said:- "We agreed to fund these security kits to help assist Merseyside Police in targeting those criminals who continue to blight our thriving communities by stealing motorbikes, scrambler bikes and mopeds and using them in an anti social manner. The Sefton Safer Communities Partnership will not tolerate this behaviour and the consequences this type of crime has on an individual or community." If anyone has any information about the anti social and criminal use or storage of motorbikes or leave information anonymously with Crimestoppers on:- 0800 555 111. Information can also be provided online. THOUSANDS of people took to the streets of Liverpool to enjoy the HSBC UK City Ride. Starting at The Strand, the route took in some of the Albert Dock's most iconic sights, before heading down Great Howard Street towards the Stanley Dock and looping back. The 5.5km route also featured an accessible loop, suitable for all adapted bikes. Liverpool born Paralympic champion Lora Fachie got the event underway before later joining participants on the route, alongside her husband and fellow Paralympic gold medallist Neil Fachie, and double Olympic champion, Steven Burke. Lora Fachie said:- "It's been wonderful to spend the day with so many people who have been out and about enjoying cycling on the streets of Liverpool. Encouraging people to get on their bikes and make cycling part of their everyday lives are what the HSBC UK City Rides are all about, and I hope today has inspired thousands of people across Liverpool to do just that." The event, delivered in partnership with Liverpool City Council, was the final of 14 HSBC UK City Rides which have taken place across the country this summer. The events are the 1st step towards HSBC UK and British Cycling's ambition to get two million people on bikes by 2020, making cycling the UK's most popular activity and sport of choice. Giles Morgan, HSBC's global head of sponsorship, said:- "Today's final HSBC UK City Ride has been a great event, with thousands of people getting on their bikes and enjoying their City's streets in a traffic free ride. Getting people onto their bikes is what our partnership with British Cycling is all about, and Liverpool has been a great host." Liverpool City Council's mayoral lead for wellbeing and the City's cycling champion, Councillor Tim Beaumont, said:- "It was great to see so many cyclists riding through Liverpool and enjoying the City. Cycling is a great way to get fit and stay fit and that is why we're delighted to have supported this event, and have committed to a range of measures to encourage people on to bikes. Hopefully some of those who took to the saddle for the 1st time in a long time today will be encouraged to make cycling a part of their life from now on." There are countless other opportunities for people of all ages and abilities to attend free, organised rides in Liverpool and right across the country via:- LetsRide.Co.UK. THE Southport and Ormskirk Hospital NHS Trust will be hosting their 1st Older People's Day, on Thursday, 5 October 2017. This event will have representatives from the Hospital and other organisations attending and will be providing advice and information. Physiotherapy, rheumatology and frailty are just some of the Hospital's services on hand throughout the day. Macmillan, Stroke Association and the Alzheimer's Society will be present, along with information about dementia, orthopaedics, mental health and many other conditions. Megan Langley, Medical and Surgical Therapy Team Leader at Southport and Ormskirk Hospital NHS Trust, said:- "Our Older People's Day is a great way for the public, patients and their families to get information on a range of conditions and available services in one place. We are here to answer any questions you might have or point you in the right direction. This is our 1st Older People's Day but if people find it useful, we're hoping to make it an annual event." The event is being held in the Clinical Education Centre, at Southport Hospital, from 9am to 1pm, on Thursday, 5 October 2017. Tea, coffee and biscuits will be available. THE Liverpool Coroner's Office are asking the public for help in tracing the next of kin of Alexander Aitchison, who recently passed away in Bootle. no suspicious circumstances surrounding Mr Aitchison's death. He was aged 49 and died on Tuesday, 26 September 2017, at his home address in Orrell Lane, Bootle. Any family members or people with information are asked to contact Coroners Officer Stephen Craig, on:- 0151 777 3422 or email:- Sefton.Coroners.Office@Merseyside.PNN.Police.UK.